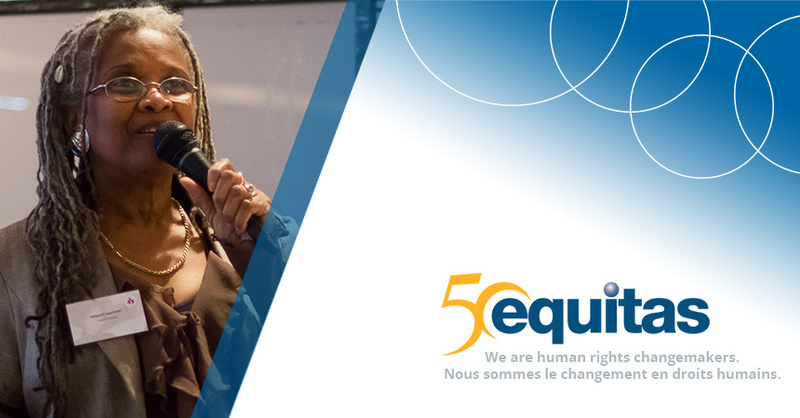 This story is part of the We are human rights changemakers series to celebrate Equitas’ 50th anniversary (#Equitas50). Throughout 2017, we invite you to discover the stories of 50 inspiring human rights changemakers. These are but a few of the hundreds who have changed lives around the world through human rights education with Equitas’ support. Monique Dauphin is a key figure in the Haitian community of Montreal thanks to her many achievements, especially for women’s rights. Monique started questioning inequality early on: “When my mother discovered the significance of the word “feminist”, she told me that I had always been one”. Monique arrived in Quebec in 1996 and immediately started to organize in support of the opponents to the Duvalier regime in Haiti, while also being involved with the women of la Maison d’Haïti. In 1995 she went back to her motherland. Haiti was restless and new opportunities for women were emerging. Monique participated in setting up the Ministry of Status of Women and Women’s Rights where she worked as the coordinator. In this position she represented the Ministry in nine regions, and was involved with women’s organizations. She is also one of the founders of the “Fanm Yo la” association (Women are here), which advocates for the inclusion of women at all levels of power. After six years, Monique returned to Montreal with this newly gained experience. She started working at la Maison d’Haïti, setting up a new group dedicated to women in the local community. Through this she met young mothers facing numerous obstacles: “Everything is difficult for them: family, studies, work, kids and above all relationships with men, that is very hard…” she explains. From Monique’s experience, young black women are more likely to become pregnant at a young age, and in a lot of cases, become single mothers. Yet, as these mothers shared with Monique, it is difficult for them to integrate with existing support organizations for mothers in the community. In response to this need, the Network of Young Parents of the Maison d’Haïti was born. Throughout their discussions, the young mothers identified relations with the Director of Youth Protection (DPJ) as a recurring issue. As a result, in 2014, with the collaboration of Equitas, they decided to organize a day of reflection on this subject. The event attracted more than one hundred participants, including educators of the child protection services, and enabled a real dialogue and mutual exchanges in both directions. “There was a need to explain our culture to educators for them to understand the Haitian community”, explains Monique. But the young mothers also needed to be informed on the causes of interventions, as well as their rights. A video was produced for the occasion where three young mothers talked anonymously about their experiences with the child protection services. Monique realized that the event had been a success when at the end of the day, the three women appeared on the stage: “for once, they felt in a situation of equality”, she remembers. A success she attributes to the participatory method at the center of the human rights-based approach. “With Equitas, we were there to facilitate their initiative. We weren’t the one telling the girls what the problem was”. “Equitas’ support has been decisive to these young women’s progression”, says Monique. Overall, more than a hundred young women have participated to the different initiatives and workshops. Today, la Maison d’Haïti continues its collaboration with Equitas, mainly through the Young Women, Young Leaders program that encourages community projects led by young women. It’s been two years since Monique retired, but she still sees the “girls” and some of them still call her on the phone. She notes that these young women have become more determined and confident. “True changes have happened in their lives”, she proudly concludes. Former manager of the women’s department, Maison d’Haïti, and facilitator of the Young Parents Network, partner of Equitas’ Young Women, Young Leaders program.